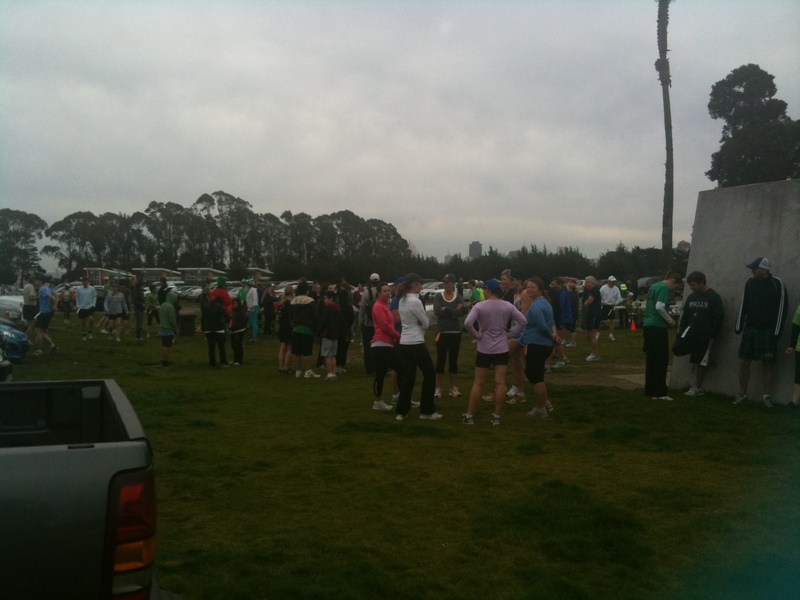 A couple of weeks ago, I set out to do a couple of training runs for the DSE St. Patrick’s Day 5K. My running hasn’t been very consistent, so I wanted to make sure I got some mileage in ahead of time. I was wishing I could be a runner. While running. Despite having participated in 6 5K races since last September, I often have a very difficult time considering myself a runner. I don’t feel confident yet. I see all of these other people knocking out their 5Ks in the 20-something minute range, and I still have yet to pull off a sub-30 minute race. I have this horrible habit of thinking that just because I’m not as fast as other people, I’m not really a runner. When I had this realization out there on my AT&T loop run, I started smiling and really enjoyed myself. Sure, I was going more slowly, but I was out there, preparing for my race. Just like a “real” runner would do. When Sunday, March 13th rolled around, I was feeling much less happy about the idea of being a runner. I had been sleeping poorly since the Japan earthquake happened, as I couldn’t pry myself away from the news at night. I told Maya via text that I was considering bailing out on the race. I felt awful. Tired. Depressed. You name the bad feeling, I felt it. She said she thought I should get up and do it anyway. Stopping your own life doesn’t really help the people in Japan. Best to get up and live it to the fullest. It’s a better way to show tribute. I wasn’t quite sure, but then I thought about the fact that I had told my blog friend A that I would be there. It’s always much more difficult to wuss out on things when other people know you are doing them, so I got up when the alarm went off at the ungodly hour of 6:30am. I made myself some coffee and peanut butter toast and then headed out to catch the 22-Fillmore down to the waterfront. Once I arrived I met up with A. She was there with her friend Sandra and Sandra’s boyfriend, E. I was introduced and we all stood around, waiting for the start. There was some entertainment as I got to listen to E ask A many silly questions…I think he was trying to psych her out. There was some weirdness when it came to lining up at the start, but before long, we were off. I started off the race feeling sluggish. The usual question, “Why the hell am I here, doing this?” hanging in the front of my mind. After a couple of minutes, however, something changed. I started thinking about how really lucky I was to be able to do this. So many people in the last 72 hours had suffered such horrible fates, but there I was, able to run a fun race. I was alive. My body was strong. I was capable of doing so much more than I give myself credit for and there was much to be happy about. From this point on, my pace quickened. Throughout the race, I did take some walking breaks, but when I was running, I was much stronger than I have been at my last couple of 5Ks. Good stride and form. Just really solid. I also took the time to take in everything around me. I usually struggle so much with the mental part of running. I focus on how much I want it to be over, or how much faster I wish I could go. I took time out during this race to appreciate how beautiful the course was. 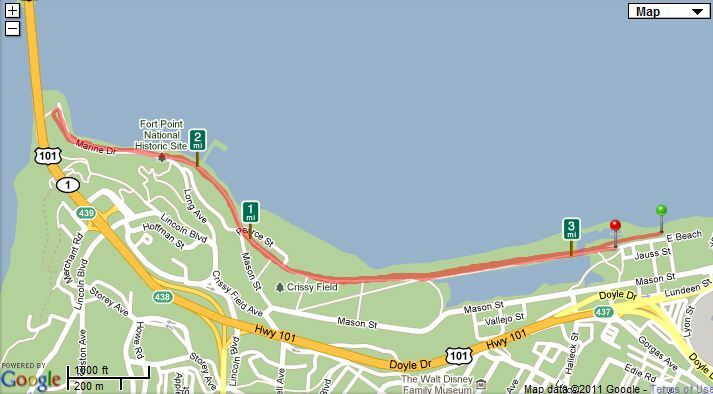 We ran down along the water right up to the Golden Gate Bridge, the turn around essentially being located beneath it. I’m not usually much for the Golden Gate, as I believe the view of the skyline is so much more majestic when you come back into the city on the Bay Bridge. 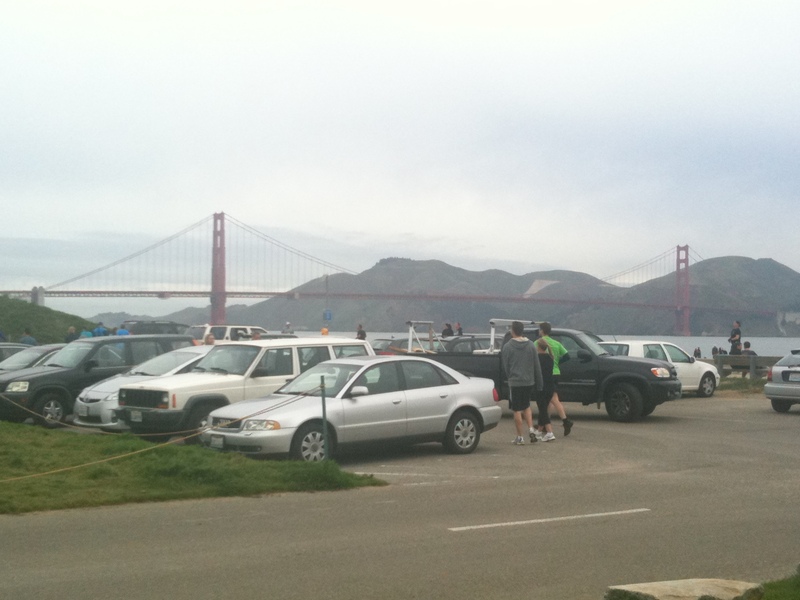 But up close, guarding the bay from the entrance to the pacific ocean, the Golden Gate Bridge is pretty amazing. After the turn around I started to tire a little, as I had been running all out. I played some games, trying to keep pace with a girl whom I’ve seen at DSE races before. I never quite caught up with her, but I made it my point in life to keep her in my sights all through the end. It was pretty nice to see my cheering squad located near the finish line. A, E and Sandra all cheered for me as I ran by and Sandra even caught my finish on her camera. 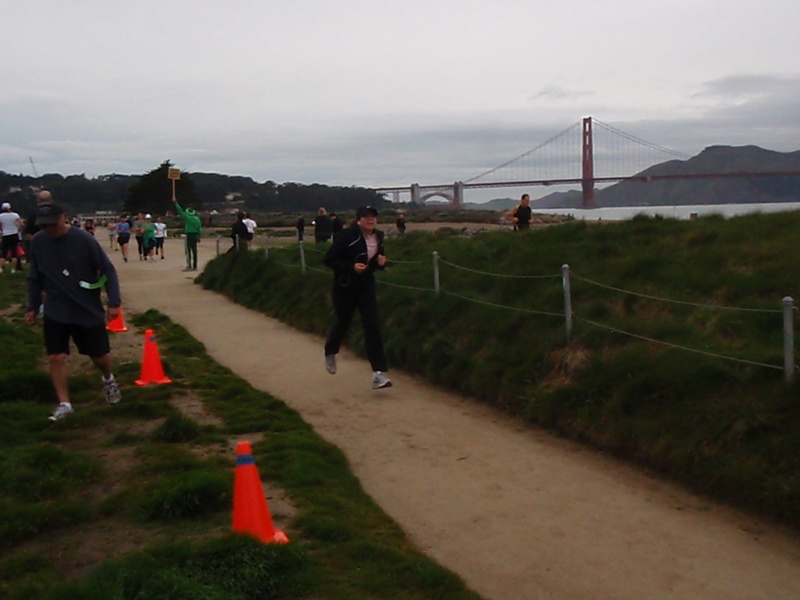 She did this cool thing where she took several rapid shots as I ran by…..
As I crossed the finish, the clock read 32:48. I was just going to miss PRing by 13 seconds. I know that if I would’ve walked less, I would’ve made it. I’m not at all upset by it though. I ran well and I felt so much better mentally once I was finished. There will always be another race. Besides, we’re all winners with DSE. Maya has asked me to tell all of you runners out there about a great fundraising effort that is going on in the running community. Run for Japan is challenging runners around the world to dedicate just one run to the people of Japan and donate at least one unit of their home currency per mile run. I think this is a really neat concept and I encourage all of you who are runners (heck, walk it if you don’t run!) to participate. Even the proceeds from a 5K can be a great help to those in need. Being a runner has absolutely nothing to do with your pace, your weekly mileage, or where you place. It’s not about forking over money to participate in races, even. It’s all about pushing your limits, trying your hardest, and getting out there and doing it. Of course you’re a runner. I know you’re right. Not getting sucked into the idea of comparison is the challenge. I know when I’ve had a good run and when I haven’t, and you’re right, often the time it took to run the distance has nothing to do with that feeling whatsoever. 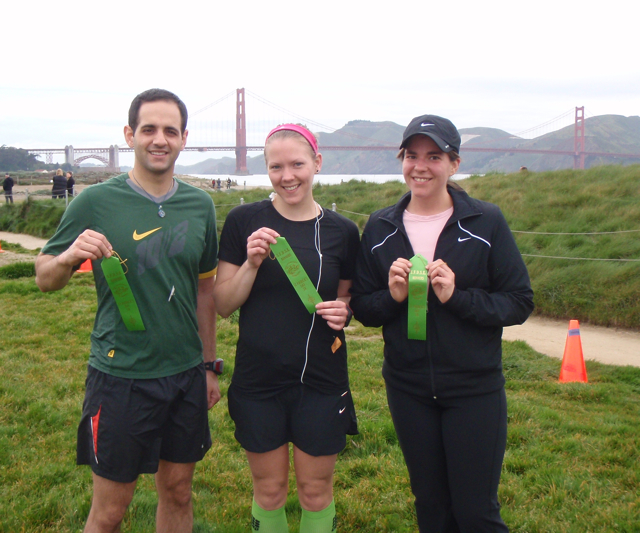 Great effort, great race and great report! I sometimes battle with the “I’m not really a runner” either, but I agree with A – it’s all about putting in the work! And GREAT photo – I’ve always wanted a photo with both feet off the ground!! I know! Isn’t the photo awesome? The whole string of them that Sandra took is pretty cool. See? That’s the benefit of NOT being the quickest….your fast friends are there at the end to cheer you on and take your picture! I love this post! I’m not a fast runner and I often feel the way you do. You articulated it perfectly! I’m glad you came to the realization that you ARE a runner and stuck with your plan to run. work and reporting! Keep up the wonderful works guys I’ve included you guys to our blogroll.